The tree is up, the decorations are in place and you’re counting down the days until Christmas. However, one thing that you might overlook when prepping your home for Christmas is lighting – and no, not the fairy lights on the tree kind of lighting! If you’re entertaining, good lighting is really important. 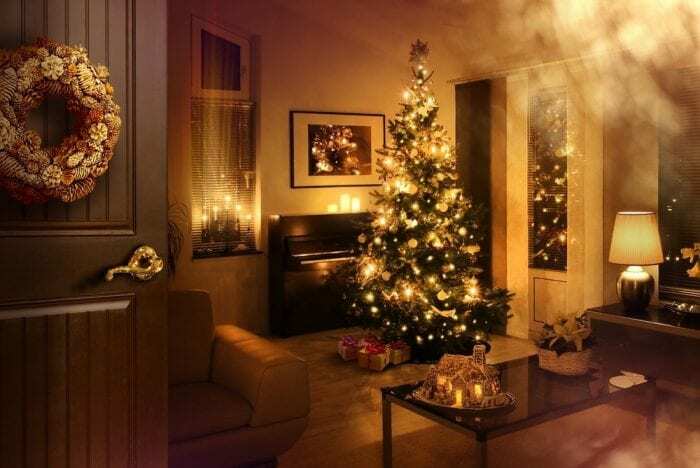 Here’s a guide to how to make sure your lighting is perfect for Christmas. If you’re spending a lot of time in the kitchen over Christmas, it makes sense to invest in great lighting. For cooking, undercabinet lighting will make such a difference. It is fitted to the front of your cabinets and it eliminates the pesky shadows which usually occur when cooking in your kitchen in the dark. Undercabinet lighting is a relatively easy job for any competent DIYer – they don’t usually need to be attached to a mains circuit and some are even battery operated. For a contemporary style kitchen, plinth lighting is a stunning addition. Plinth lighting consists of small bulbs which are fitted to the bottom of your units. You could even use strip lighting on your units, which will create an illusion that your units are floating! Cosy evenings watching Christmas films, family game nights fighting over Monopoly and the post-dinner cheeseboard…all activities which will most likely take place in the living room over the festive period. For so many different activities, you’re going to need different types of lighting. Alongside your main light, you will need some ambient lighting. This could be floor lamps which can be dimmed, or you could be creative and use strip lighting around your TV – Light Supplier have colour changing backlights for your TV, which is sure to impress any guest. Of course, the turkey is sure to be the star of the show, but having a light as a centrepiece is great as it lasts beyond the festive period. For the dining room, chandeliers look amazing, but if you’re looking for something more understated, consider pendant lighting. A big trend throughout 2017 has been the geometric shape pendant light, and they give off a fantastic bright light which is perfect for the dining room. For the after dinner chatter, make sure your light has a dimmer switch so you can make the atmosphere more relaxing. By outdoor lighting, we don’t mean the novelty lights that illuminate your next door neighbour’s home from the end of November! We’re talking about outdoor lighting for safety. If you have a lot of guests over the festive period, it is a good idea to illuminate your driveway path with outdoor lights, and highlight any steps, so that they don’t fall – particularly if they’ve had too much mulled wine. If you’re lucky enough to have a decking area, it may be worth installing decking lighting so that if anyone wants to nip outside for a cigarette or on the phone, they are safe. After all, no one wants to have their Christmas ruined by a trip to A&E! Is your lighting ready for Christmas? What Is Your All Time Favourite Christmas Advert?